M.A., Union Theological Seminary, Columbia University, 1964. Ph.D. (Philosophy), Columbia University, 1969. Professor Brown’s teaching, research, and service are concerned with ethics, governance, and the protection of the environment. His appointments at McGill are in the School of Environment, the Department of Geography, and the Department of Natural Resource Sciences. He was the first full time Director of the McGill School of Environment. The McGill School of Environment is involved in building programs with McGill’s Faculties of Arts, Science, Agricultural and Environmental Sciences, as well as Religious Studies, Law, Engineering, Management, and Medicine. Before coming to McGill he was Professor of Public Policy at the University of Maryland’s graduate School of Public Affairs. While at the University of Maryland he founded the Institute for Philosophy and Public Policy, as well as the School of Public Policy itself. Professor Brown established the School’s Environmental Policy Programs to operate not only at the University’s College Park campus, but also at Maryland’s Department of the Environment, and at the United States Environmental Protection Agency. He has held numerous administrative positions within the University of Maryland System. He has taught at Princeton University’s Woodrow Wilson School of Public and International Affairs, at the University of Washington, and at St. John's College in Annapolis. In the early 1970s, he was Visiting Fellow at Battelle Seattle Research Center and Assistant Vice President for Research Operations at The Urban Institute. He is currently a Research Scholar at the Center for Humans and Nature. Professor Brown has served as a consultant/advisor to numerous organizations, including the Aspen Institute for Humanistic Studies, the Ford Foundation, Bard College, the University of Southern Maine, the University of Maine at Orono, the National Endowment for the Humanities, Colorado State University, the Hastings Center, the Academy for Contemporary Problems, Austin College, Battelle, Clark University, the Department of Energy, the National Academy of Public Administration, the Department of Health and Human Services, the Global Environmental Institute, the National Science Foundation, the United States Environmental Protection Agency, the Maryland Department of Natural Resources, the Social Science and Humanities Research Council of Canada, and the Urban Institute. He has or does serve on the boards of: Defenders of Wildlife, Science and Technology Advisory Board: Environment Canada, Georgia Tech School of Public Policy, Common Cause, the Eastern Shore Land Conservancy, the Institute for Policy Studies, the Maryland Environmental Trust, the Global Development and Environment Institute at Tufts University, Blue Hill Heritage Trust, Friends of Walker Pond, and the Editorial Advisory Board Politics and the Life Sciences, for which he served as Canadian contributing editor. He is a Fellow of the Hastings Center, serves as a Governor of Les Amis de la Montagne, he was a member of The Expert Working Party on Biotechnology, Sustainable Development and Canada's Future Development, and is listed in Who’s Who in America. He is a member of the Religious Society of Friends, and of the Global Environmental and Climate Change Center(GEC3) at McGill University. 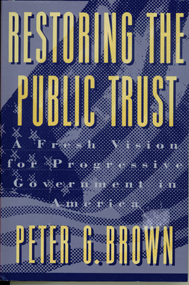 Professor Brown is the author of Restoring the Public Trust: A Fresh Vision for Progressive Government in America (Beacon Press, 1994), and Ethics, Economics, and International Relations: Transparent Sovereignty in the Commonwealth of Life (Edinburgh University Press, 2000); re-published in Canada by Black Rose Press (2001) as The Commonwealth of Life: A Treatise on Stewardship Economics. Second editions of both of the latter books were published in 2008. In Canada it is entitled The Commonwealth of Life: Economics for a Flourishing Earth. He is currently working on three new books. One is tentatively entitled Reverence for Life: A Philosophy for Civilization which is intended as a sequel to Albert Schweitzer’s Philosophy of Civilization published in the 1920s. This book is a long range project. He is also a co-author of a book on macro-economics entitled Right Relationship: Building a Whole Earth Economy. It will be published by Berrett-Koehler in February 2009. With Jeremy Schmidt he is co-editing and authoring sections of a volume tentatively entitled Water Ethics: The Moral Foundations of Natural Resource Policy. It will be published by Island Press in Washington, DC. in late 2009 or early 2010. 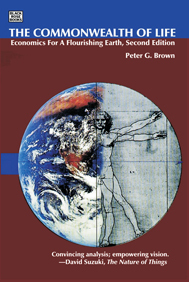 Professor Brown has edited several books: Markets and Morals; Food Policy: The Responsibility of the United States in the Life and Death Choices; Human Rights and U.S. Foreign Policy: Principles and Applications; Income Support: Conceptual and Policy Issues; Boundaries: National Autonomy and its Limits; The Border That Joins: Mexican Migrants and U.S. Responsibility; and Energy and the Future. He has written chapters for several other books: Who Speaks for the Child: The Problems of Proxy Consent; Equity Issues in Radioactive Waste Management; L'Etica nelle politiche ambientali; Ethical and Legal Issues of Social Experimentation; The Ethics of Social Intervention; Non‑technical Issues in Nuclear Waste Management: Ethical, Institutional and Political Considerations; Population Policy and Ethics: The American Experience; Ethical Issues of Population Aid; Building Sustainable Societies; Etica, Democracia, y Desarrollo Humano, Public Duties: The Moral Obligations of Public Officials; VIII Biennial Asilomar Conference on Transportation, Energy and Environmental Policy: Managing Transitions; and The Virtues of Ignorance. He has written articles appearing in The National Tax Journal; The Washington Post; The Hastings Center Report; The Journal of Urban Law; American Bar Association Journal; Land Use Law and Zoning Digest; Policy Analysis; Policy Studies Journal; The Encyclopedia of Bioethics; Bulletin of the Atomic Scientists; National Forum; Journal of Public Policy and Management; Issues in Science and Technology; Journal of Socio‑Economics; Energy Policy; Watershed; Ecological Economics; Climatic Change; The Good Society; Public Administration Review; Association of University and Colleges of Canada (University Affairs); The Baltimore Sun; The Montreal Gazette; La Presse de Montréal, The Encyclopedia of the Environment and Le Tract: Reflexions sur des problèmes contemporains, Quaker Eco-Bulletin, The Journal of Politics and the Life Sciences, Annals of Earth, and The Journal of Forestry. Professor Brown is involved in tree farming and conservation efforts in Maryland, Maine, and Quebec. He is a Certified Quebec Forest Producer. His farm in Maryland is enrolled in the Forest Stewardship, and the Maryland Agricultural Land Preservation, Programs. At the appointment of the Governor of Maryland he served as the first Chair of the Rural Legacy Advisory Committee. The Rural Legacy Program, part of a comprehensive set of policies to manage growth in Maryland, aims to conserve 200,000 acres of land in Maryland from development through the purchase of development rights. With Russ Brinsfield he founded the Eastern Shore Land Conservancy. With Colin Scott and the Cree Nation of Wemindji he has helped plan for a culturally appropriate protected area in the vicinity of the Old Factory and Poplar Rivers in the James Bay region of Quebec. Growing out of this effort the Quebec government has just proposed that over 4000 sq. km be set aside as a biodiversity preserve. In 1995 he was named “Tree Farmer of the Year” in Garrett County, Maryland. He has served as the “Steward” of Walker Pond in Hancock County, Maine. I am looking for up to 2 students to work with me on stewardship economics -- designing an economic system compatible with, and respectful of, the Earth's living communities and the chemical and physical processes on which they depend. Financial support of approximately 20,000 CAD per year is available for three years. Ph.D. level student(s)preferred.